Photos from Lithuanian ghetto turn out to be family of America's most prominent Yiddish scholars. (JTA) - When documentary photographer Richard Schofield stumbled upon a trove of unidentified prewar photographs in September 2013 in the storage room of the Sugihara House museum in Kaunas, Lithuania, he knew he had found something special. 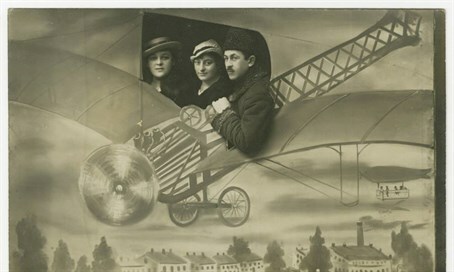 The photos, dating from about 1910 through 1940, were from a Lithuanian Jewish family's album that had been smuggled out of the city’s wartime Jewish ghetto and entrusted to a non-Jewish Lithuanian family for safekeeping. But nobody knew what had happened to the people in the pictures. Presumably they had not survived the war to reclaim their photos. Touched by the images and intrigued to learn what had happened to their subjects, Schofield set about trying to identify them. He scanned the 112 photos, set up a Facebook page to showcase them and commissioned a piece of music to accompany an exhibition of the photographs that would mark the 75th anniversary of the ghetto in Kaunas, then known as Kovno. Then, in late March, by a twist of serendipity, a non-Jewish archivist who worked at the Jewish museum in the Lithuanian capital city of Vilnius noticed something: After clicking through the photographs and doing a bit of sleuthing, Saule Valiunaite realized that one of the photos appeared in a Holocaust documentary film made in 1999. It turns out the photos weren’t of some obscure Jewish family but that of two of America’s best-known Yiddish scholars: Ruth Wisse of Harvard and her brother David Roskies of the Jewish Theological Seminary. Roskies had written a memoir about his family, “Yiddishlands ,” in 2008. A third sibling, Eva Roskies Raby, is a former director of the Montreal Jewish Public Library. The album Schofield had found belonged to Anushka Warshawski, the siblings’ aunt, who had perished during World War II, in October 1943, along with the rest of her family. Of Anushka’s 10 siblings, only two survived the war. One had immigrated to America decades before the Holocaust. The other was Wisse and Roskies’ mother, Masha, who fled Czernowitz (then part of Romania) for Montreal in 1940. For her children, who grew up on their mother’s stories of life before the war, the album’s discovery offered some tantalizing new details about family members they had been hearing about their whole lives. “When I saw these pictures, it felt like a huge piece of the puzzle had fallen into place,” Roskies told JTA in an interview from Jerusalem, where he is spending a semester teaching at Hebrew University. “It was a huge family, and they all died,” Roskies said. “My mother dedicated the rest of her life to keeping the memory of that family alive. She told stories about them three times a day, at breakfast, lunch and dinner. My mother believed that history ended in 1940, that everything important ended the moment she left Europe. The newly discovered album confirms the special bond between his mother and Anushka, Roskies said. The two sisters (half-sisters, actually, since Masha was born to her mother’s second husband) corresponded and sent photos back and forth during the years after they married and lived apart – Anushka in Kovno and Masha in Vilna and then Czernowitz. They reunited only once during those years, in Czernowitz in 1938. After that, they never saw each other again. “Just as my mother was religiously saving these pictures of Anushka and her other sisters and their children, Anushka was doing the exact same thing in Kovno,” said Roskies, the Sol and Evelyn Henkind chair in Yiddish literature and culture at JTS. In one picture, there’s a young Ruth Wisse (then Roskies), probably age 4, bundled up against the snow and venturing forth on ice skates. Ruth was one of two children Masha had in Czernowitz before the war; she had two more in Montreal. David Roskies, now 68, is the youngest. Wisse, recently retired from Harvard as its Martin Peretz professor of Yiddish literature and professor of comparative literature, now lives in New York. In another photograph is Nyonya, Masha’s favorite brother, in his Red Army uniform from World War I. He died in the influenza epidemic of 1918. Some photographs feature Anushka with her second husband at a lumberyard, suggesting that may have been the source of his considerable wealth, according to Roskies. There are also quite a few photos of Anushka’s first husband, with whom she had a child who later disappeared into the Soviet gulag, and shots of Anushka at an orphanage where she may have worked. Still fresh in the discovery stage, Masha’s three surviving children -- Roskies in Jerusalem, Wisse in New York and Raby in Montreal -- are trying to piece together many essential details about the photographs. Schofield, who is still recovering from the shock of the discovery, is raising money for a piece of music he’s calling the “Kaunas Requiem” that he hopes to stage at an installation in September to mark the 75th anniversary of the establishment of the Kaunas/Kovno ghetto. He’s not yet sure how he’ll incorporate the new information about the photographs. He credits Valiunaite, who works as a historian in the Department of Righteous Gentiles at the Vilna Gaon Jewish State Museum, with putting the pieces together. Valiunaite says she figured out the connection to Roskies by finding a match between a sanitorium resort that appeared in the photographs and Lithuanian records showing the resort was owned by the Warshawski family. She later discovered that Anushka had something of a musical career – a detail mentioned in Roskies’ book and in a 45-minute documentary film from 1999 called “Daughter of Vilna: The Life in Song of Masha Roskies.” The final proof was a photo in the film that matched one found in the trove. Valiunaite contacted Wisse and Roskies immediately, about four weeks ago. “They’re quite famous, so it’s easy to find them,” Valiunaite said. The fact that Anushka went to the trouble of smuggling the album out of the Kovno ghetto speaks volumes, Roskies said. By the time of the ghetto’s liquidation, in 1943, it must have been clear to the Jews who remained that they, too, soon would be headed to their deaths, Roskies surmises. Though Masha died in 1999 at 93, Roskies says the photos’ discovery is still a homecoming.